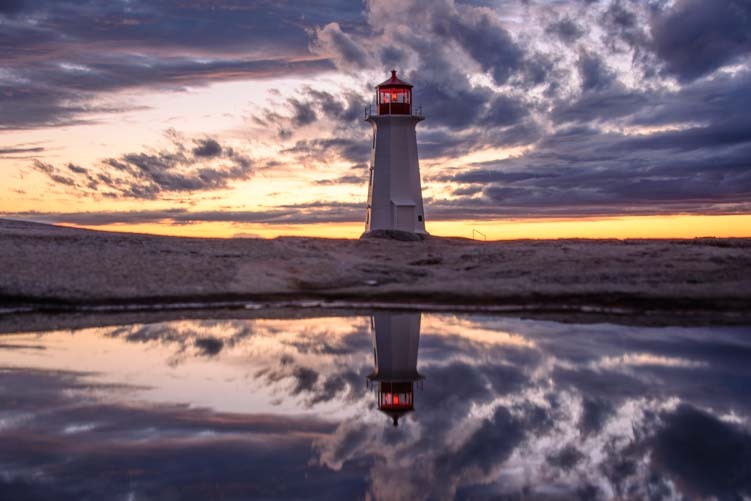 Peggy's Cove Lighthouse, Nova Scotia - Reflections At Sunset! 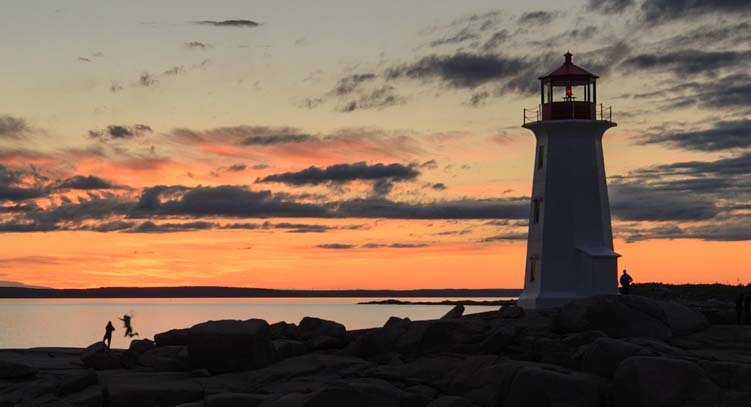 Peggy’s Cove Lighthouse, Nova Scotia – Reflections At Sunset! 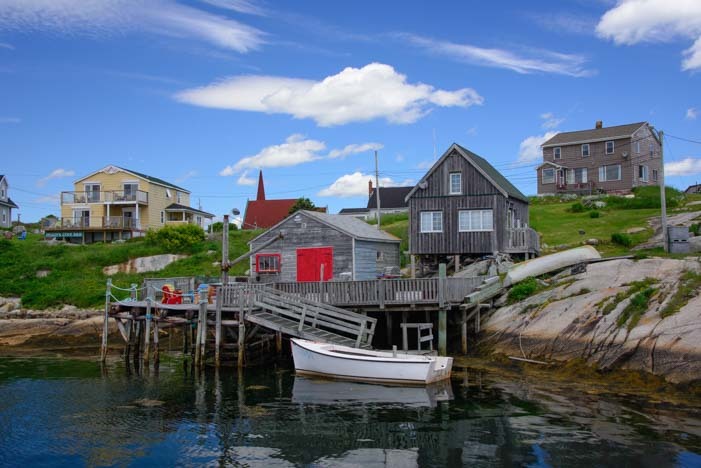 June 2015 – After a heavenly few weeks in Downeast Maine, including a daytrip to Campobello Island in Canada, we crossed the border into Canada “for real” at the small town of Calais, Maine. The province of New Brunswick is very large, and it took us a while to decide whether to dash through it to Nova Scotia or to take our time. The huge tides and seascapes of the Bay of Fundy beckoned, but in the end we decided to hightail it to Nova Scotia, a place we had both wanted to visit for many many years. 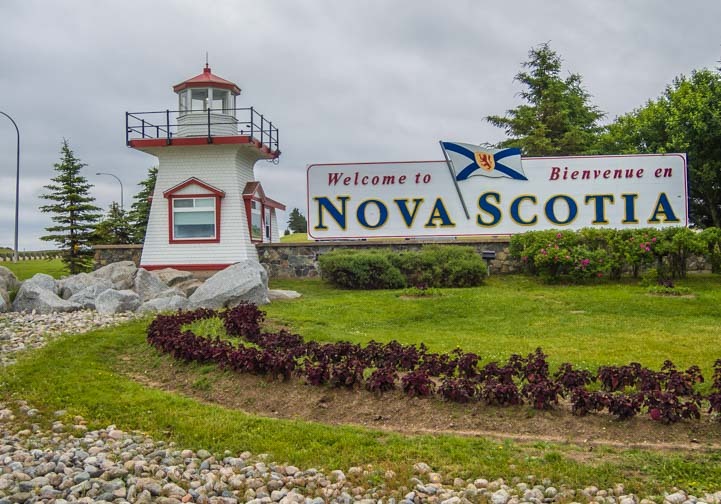 The island of Nova Scotia is a large province too, extending some 300 miles from end to end. We had had visions of encircling the circumferance of the island very slowly, and started out doing just that along the northern shore. The farmlands and low lying, flat lands of that coast were pretty, but we we had quaint fishing villages and craggy rocks and lighthouses on our minds more-so than farms, so we quickly changed gears and made a dash for the southern coast. 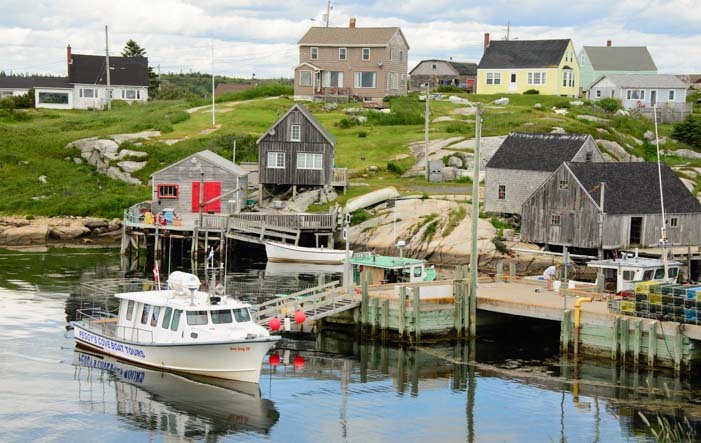 We landed at Peggy’s Cove, which is about as quaint and cute a fishing village as there can possibly be. 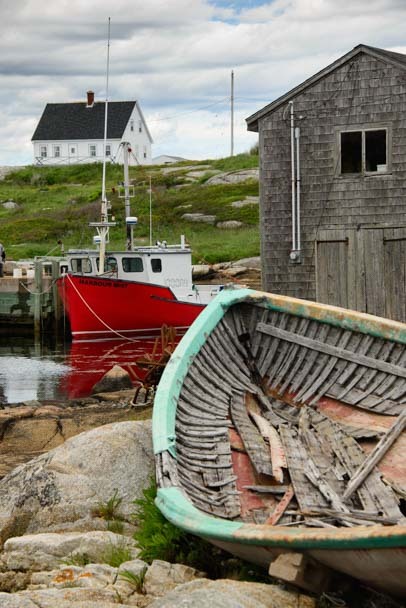 The small community of Peggy’s Cove, Nova Scotia. This is a tiny hamlet of just a few buildings surrounding a very small harbor that contains a handful of boats. As we walked along the docks, the fishing boats seemed to hover on glassy water. 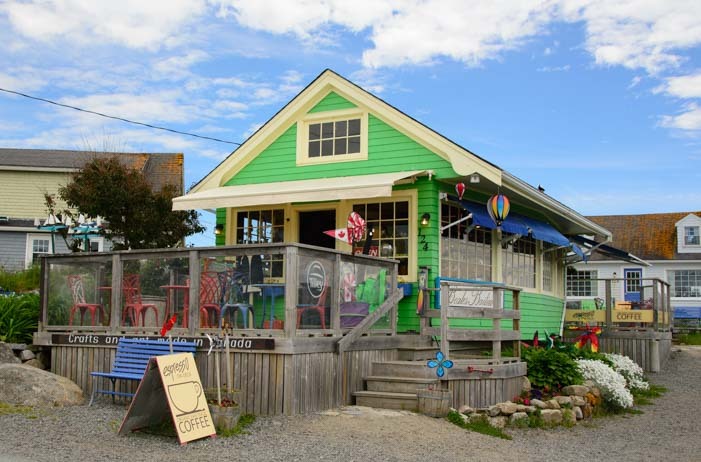 Each building was lovingly maintained to utterly quaint perfection, including the little coffee shop that looked out on the small cove. I love a cute coffee shop! Lobster traps were positioned along the wharf, and an old deteriorating dory made a wonderful photo op with a red lobster boat in the background. There were ideal photo ops in every direction. This is an artist’s haven, and a few steps up a hill we came across an artist recreating the picture perfect harbor scene on his canvas. We joined a small throng of people taking photos of him! 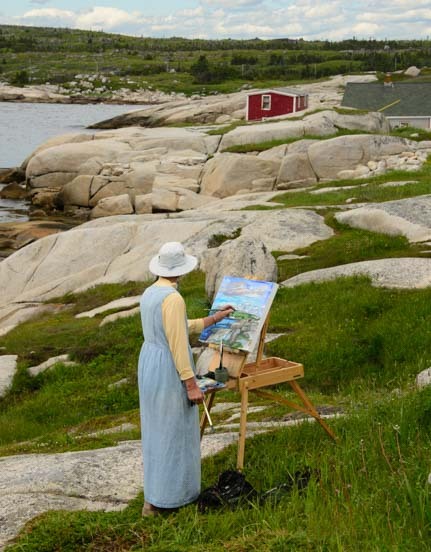 What a lovely spot to set up an easel and let your creative juices flow! Just a few steps further on we found another artist, and the throng joined us to photograph her too! 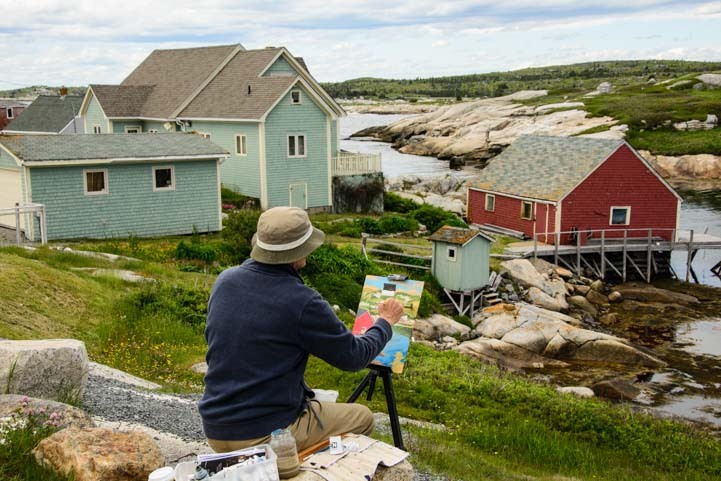 The artists — and everyone else — were loving the charming scenery and landscapes. This is an idyllic little seaside village that is a photographer’s or artist’s true delight. In some ways it was almost a little too perfect, but we were loving every minute of strolling the very short street that goes from the harbor to the lighthouse. Before the lighthouse came into view, we could hear the mournful sound of a bagpipe in the distance. 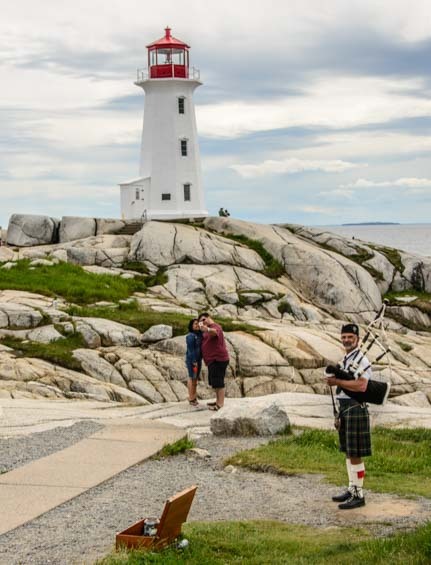 As we turned the corner, the lighthouse appeared and the bagpipe player was suddenly right before us. He was wearing a kilt and had an open donation box near his feet. Behind him a couple was taking a selfie of themselves with the lighthouse in the background. We were enchanted by this sweet postcard of a village, if just a little put off by its so perfect perfection and the crowds of tourists arriving from the row of buses that were squeezed into the small parking area. But as the daytime turned to late afternoon, something truly magical happened. The sky turned grey and black, and beneath the heavy clouds the sun suddenly put on a spectacular display at the lighthouse. 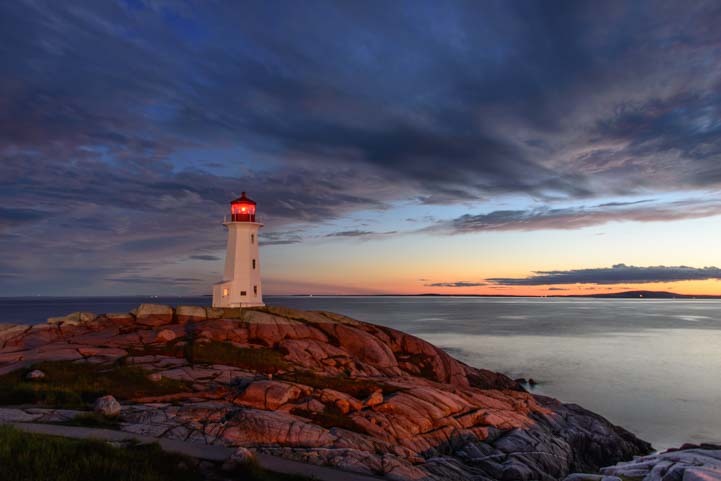 Peggy’s Cove Lighthouse becomes the centerpiece of a celestial light show. 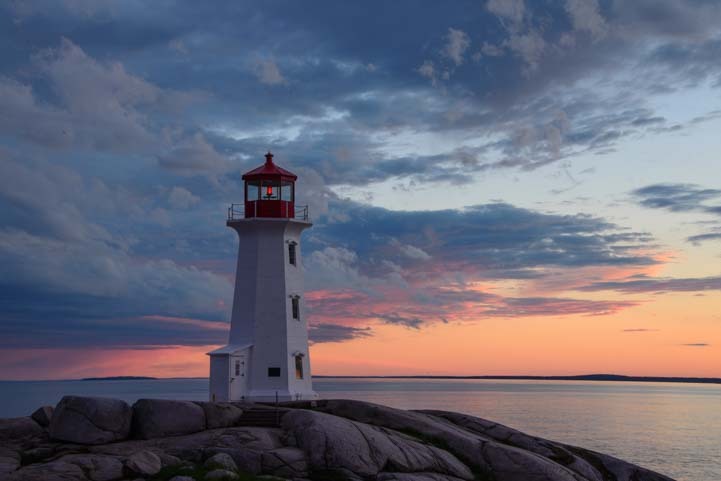 Peggy’s Cove Lighthouse is one of the prettiest lighthouses in Nova Scotia — perhaps the prettiest — and to see it with such a stunning backdrop was a true gift. As the sun set, groups of kids, couples and families all came out onto the rocks to watch it drop into the sea behind the lighthouse. And what a show they had that night. Lots of families and couples and kids sat on the rocks to enjoy the sunset. Once the sun dipped below the horizon, the sky lit up in shades of peach and orange. Kids were playing all around, suddenly full of energy, and their silhouettes were delightful. The rocks around the lighthouse glowed orange, and the lighthouse began to flash a vivid red. The light flashes in the last moments of daylight. We were both in awe to be experiencing such a dramatic sunset in such a breathtaking location. As the sky grew dark, we sat down on the edge of the rocks and looked out at the sea, holding each other in a long embrace. After all those years on a boat, neither of us will ever look at the sea in quite the same way again. The chill of nightfall began to steal over us as the waves crashed on the rocks below, and the black, open ocean lay in front of us the way it had so many times before on our long overnight passages in Mexico. Those days seemed like a lifetime ago, but suddenly the memories were just an arm’s length away. “I can’t believe we were out there,” Mark said suddenly. “I know — I can’t believe we did it either!” I added. “I was terrified for four years,” he confessed. We stood up to go and suddenly noticed some tidepools behind us creating beautiful mirror images of the lighthouse in the water. We stared out at the darkening sea, sharing a deep sense of awe. We were in awe of the scene, in awe of life, and in awe of having dreamed a dream, made it come true, and come out of it alive, unscathed, and forever changed. 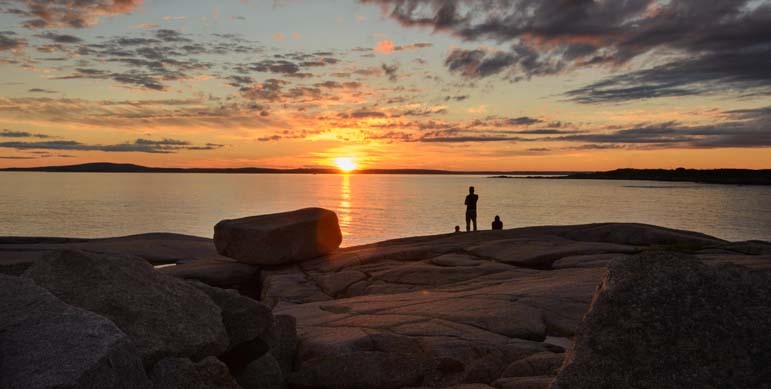 What a precious and unique moment that was at Peggy’s Cove in Nova Scotia — a sunset we will never forget. 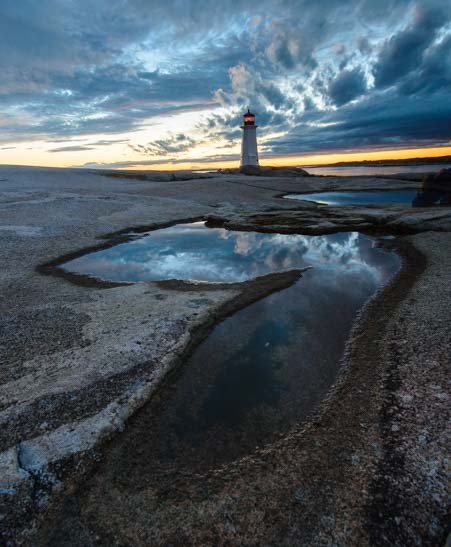 Lighthouses of Lubec & Campobello – The Quoddy Sisters! 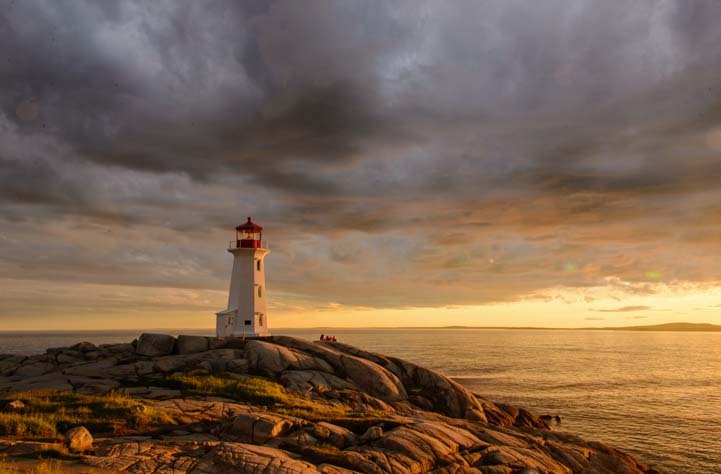 This entry was posted in Canada and tagged Canada, New, Nova Scotia, Travel, WP Travel by Roads Less Traveled. Bookmark the permalink. How wonderful to hear from you Kathie, and especially to know that these images touched you so much! The pics are both of ours — in the sunset sequence the 8 shots are from Em, M, M, M, Em, Em, Em, M — and it’s so satisfying that we were each able to capture the spirit of the moment in our own ways. Enjoy San Diego and all those sailboats…we have such great memories of watching the tall ships with you!! What a delight to wake up to with my morning coffee! Breathtaking pixs. I so enjoy sharing you adventures- always wanted to motorcycle to Nova Scotia. Traveling for the last year, I found the Oregon coast in the early spring to be enchanting- sharing your pixs , I now realize enchantment lurks down every road if one is open to delight. Thank you for the visual treat and emotional insight, sharing your thoughts was endearing – somehow making me feel like a close and valued friend. As a full timer, those feelings are precious. Keep posting and sharing and enhancing your readers’ lives! Wow! I am touched!! It goes both ways, Kathy, and your comment has put a little zing into my footsteps today too! We are finding that there is beauty and pleasure almost everywhere, although often it’s not quite where you expect it to be. Aren’t we both so fortunate to be able to live this way?! Sometimes it’s unnerving to share deeply personal feelings with the world through a blog, but I know many readers have big dreams, and sometimes those dreams can be intimidating. So, it’s my hope that by expressing a few of our emotions from when we look back at our fulfilled dream we may help those coming along behind us. Absolutely stunning! My wife and I can not wait until we travel there next year. We love following your travels. Thank you, Glynn. It’s so nice to know our travels inspire you. You’ll have a great trip next year!! What a lovely story and beautiful photographs! Brings back memories of a long ago childhood trip to Peggy’s Cove and crossing the Bay of Fundy on a ferry in the remnants of a hurricane many years ago! Makes me itch to go back again with my hubby! Keep the stories and photographs coming! Safe Travels! Sounds like quite a trip and some very special memories of this unique place! Your lighthouse pictures are fabulous. 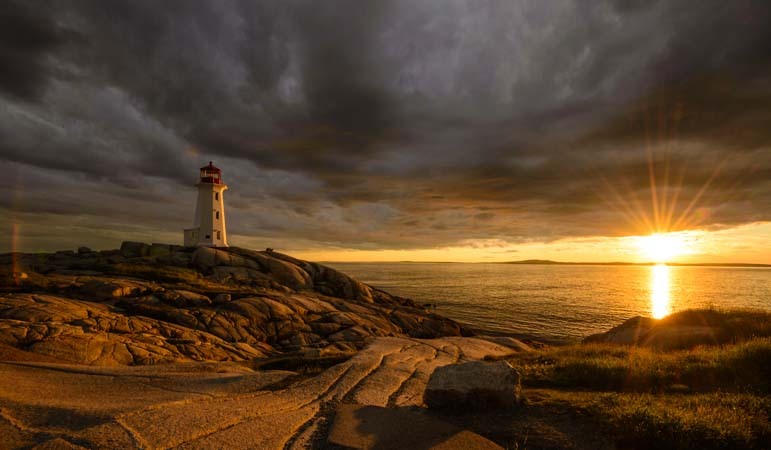 We missed our opportunity to visit Peggy’s Cove a couple of years ago when on a fall cruise.. The weather changed our direction. Some day I’d love to return. When I first viewed your “lucky 7” shot it reminded me of a whales tail! That starburst shot….just fabulous. All of the coastal jewels in the northeast are “subject to the weather,” and we got really lucky in Nova Scotia and Maine as well this year. No fog, and rain only a few times!! Those two photos are both Mark’s, and they are stunners, aren’t they?! 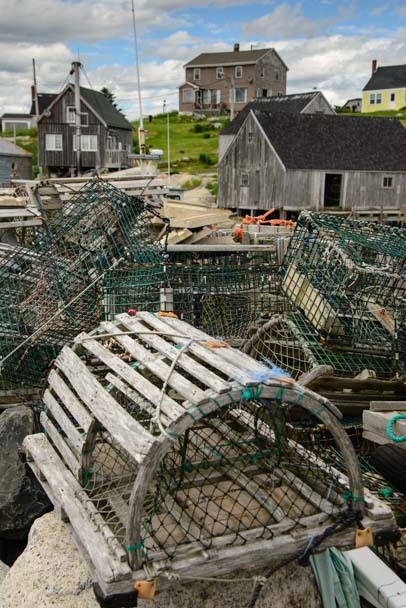 Your shot of “Lobster Pots” would make an awesome 1000 piece puzzle. Try submitting to a couple puzzle manufacturers.